So, you’ve got yourself a rabbit and you’re asking yourself, what you can safely feed it? Or maybe you’re just randomly interested in what rabbits like to eat and drink. If you want to have a happy, safe and friendly bunny, read on. The most important thing your bunny needs is fresh, clean water…and lots of it. Water is the ONLY liquid it needs to survive. Ideally, it should be changed twice daily and served in a ceramic bowl that cannot be tipped over. In warm weather, you can also add a couple of ice cubes to it. Without water, your rabbit would be dead within three days…that’s how important it is! Rabbits need water to keep their vital organs functioning and their blood healthy. It also helps their digestive systems and flushes away the excess calcium that they build up. They do drink a lot of water, but if you notice that they are drinking excessively, it is possible that they are in pain or in distress. It is always a good idea to take them to the vet to be checked over. 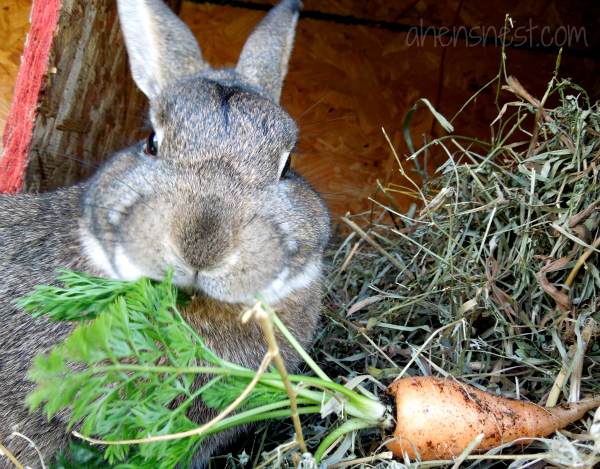 80/90 per cent of your rabbit’s food should be fresh hay. It gives them fibre and also helps to wear down their teeth. Not only that but it helps to keep them occupied. You could also add some foraging material in the form of tree bark, twigs and sprouts, seeds and small amounts of fruit (but only as a treat). In addition, you can feed them with certain plants, herbs and weeds. If your rabbit has his own enclosure, you could even have some live plants growing there for him. Rabbit chomping on a carrot top. You can ring the changes by feeding a variety of fresh, pesticide-free vegetables on a regular basis. Feed him approximately 1 cup of vegetables per 4lbs of body weight daily. These can be purchased at most supermarkets and should be high in fibre and low in protein and not mixed with anything else. As your rabbit gets older you should reduce the number of pellets gradually. Just a small handful daily is sufficient. These should only be fed in moderation and as the occasional treat, up to two tablespoons a day. This is because they contain a lot of sugar which is not good for your rabbit’s health, but they really enjoy the taste! However, don’t give them any pips, stones or plants unless it is in the preceding list. Bread, crackers, pasta, pretzels, yoghurt chips, chocolate, milk or cereal. Potatoes, avocado, daffodils, rhubarb, lilies, mushrooms, sweet peas, iceberg lettuce, broad beans, buttercups, kidney beans, jasmine foxgloves. All of these can make your rabbit very ill and sometimes it can be fatal. So, as you can see, your bunny doesn’t need much to keep him healthy, but by feeding a varied and interesting diet he will be one very happy bunny too!